Oats as a food product is known from ancient times. The Roman scholar Pliny wrote that the Germans prepared oatmeal. 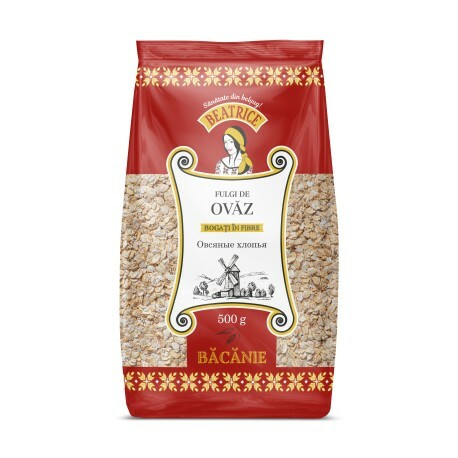 Nourishing, useful and inexpensive oatmeal is a favorite breakfast all over the world. Today from oat groats produce thin oatmeal. which are preparing in a minutes. Oat flakes in the first years of Soviet power appeared for sale under the "Hercules" trademark. Ancient hero Hercules symbolizes strength, oats in the folk tradition is considered cereal that give strength and endurance. Calorie oatmeal is 366 kcal per 100 grams of product. Oatmeal has a high nutritional value, chemical composition of oatmeal includes all components which important for healt: potassium, magnesium, phosphorus, chromium, iron, manganese, iodine, fluorine, and many others. Oatmeal normalize blood clotting, help in the intestine, control the absorption of fat by the body. Grains of oats, even crushed, act as a kind of scrub for intestine, brushing his walls from all the "garbage", removes all toxins. Oatmeal - a remedy for chronic inflammation. Oat-flakes is not only used for porridges and added to the muesli. They are excellent for many meals. You can bake oatmeal cookies / cake or before frying on the grill, roll in oat-flakes trout or mackerel.